Dogs and wolves are genetically so similar, it's been difficult for biologists to understand why wolves remain fiercely wild, while dogs can gladly become "man's best friend." Now, doctoral research by evolutionary biologist Kathryn Lord at the University of Massachusetts Amherst suggests the different behaviors are related to the animals' earliest sensory experiences and the critical period of socialization. Details appear in the current issue of Ethology. Until now, little was known about sensory development in wolf pups, and assumptions were usually extrapolated from what is known for dogs, Lord explains. This would be reasonable, except scientists already know there are significant differences in early development between wolf and dog pups, chief among them timing of the ability to walk, she adds. To address this knowledge gap, she studied responses of seven wolf pups and 43 dogs to both familiar and new smells, sounds and visual stimuli, tested them weekly, and found they did develop their senses at the same time. But her study also revealed new information about how the two subspecies of Canis lupus experience their environment during a four-week developmental window called the critical period of socialization, and the new facts may significantly change understanding of wolf and dog development. When the socialization window is open, wolf and dog pups begin walking and exploring without fear and will retain familiarity throughout their lives with those things they contact. Domestic dogs can be introduced to humans, horses and even cats at this stage and be comfortable with them forever. But as the period progresses, fear increases and after the window closes, new sights, sounds and smells will elicit a fear response. Through observations, Lord confirmed that both wolf pups and dogs develop the sense of smell at age two weeks, hearing at four weeks and vision by age six weeks on average. However, these two subspecies enter the critical period of socialization at different ages. Dogs begin the period at four weeks, while wolves begin at two weeks. Therefore, how each subspecies experiences the world during that all-important month is extremely different, and likely leads to different developmental paths, she says. Lord reports for the first time that wolf pups are still blind and deaf when they begin to walk and explore their environment at age two weeks. "No one knew this about wolves, that when they begin exploring they're blind and deaf and rely primarily on smell at this stage, so this is very exciting," she notes. She adds, "When wolf pups first start to hear, they are frightened of the new sounds initially, and when they first start to see they are also initially afraid of new visual stimuli. 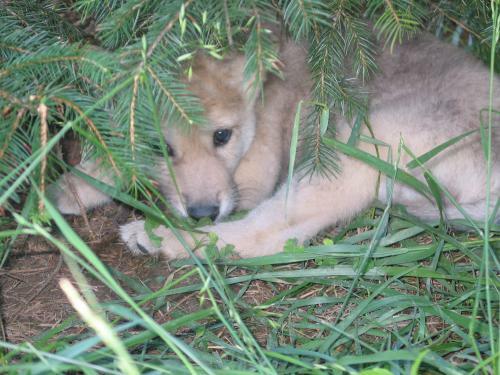 As each sense engages, wolf pups experience a new round of sensory shocks that dog puppies do not." Meanwhile, dog pups only begin to explore and walk after all three senses, smell, hearing and sight, are functioning. Overall, "It's quite startling how different dogs and wolves are from each other at that early age, given how close they are genetically. A litter of dog puppies at two weeks are just basically little puddles, unable to get up or walk around. But wolf pups are exploring actively, walking strongly with good coordination and starting to be able to climb up little steps and hills." These significant, development-related differences in dog and wolf pups' experiences put them on distinctly different trajectories in relation to the ability to form interspecies social attachments, notably with humans, Lord says. This new information has implications for managing wild and captive wolf populations, she says. At the gene level, she adds, "the difference may not be in the gene itself, but in when the gene is turned on. The data help to explain why, if you want to socialize a dog with a human or a horse, all you need is 90 minutes to introduce them between the ages of four and eight weeks. After that, a dog will not be afraid of humans or whatever else you introduced. Of course, to build a real relationship takes more time. But with a wolf pup, achieving even close to the same fear reduction requires 24-hour contact starting before age three weeks, and even then you won't get the same attachment or lack of fear."